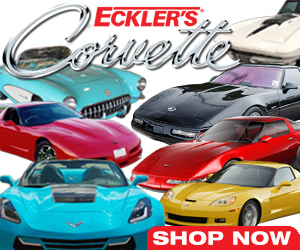 The Worlds #1 Corvette VIN Decoder for 10 years straight! Sequence Descriptions for all Years and Special Editions. Even the new C8! All years are covered just keep scrolling to the bottom where you will find the latest model Corvette Information. Visit our Corvette Answers Consulting Tab if you need help decoding! 1953 to early 1960 Driver-side door post area. 1955 left door hinge below courtesy lamp switch. 1956-59 Left door hinge pillar below upper hinge. Early Corvette's that had 6 Cylinder engines did not have the Letter "V" as the first Sequence Number. The Letter "V" stands for V8. The VIN of 6 cylinder cars will always start with the Letter "E". This is why the VIN will be 10 digits for 1953-54 cars. For the 1955 model they added the letter V to get 11. After 1955 they went back to a 10 digit sequence. Production total of 300 were produced Flint, MI. Early 1960 Left Door hinge pillar below upper hinge. Late 1960 to 1962 Steering column aft of steering gear housing. 1963 to 1964 Spot welded to body hinge brace under the glove box. 1965 to 1967 similar to the 1963 to 1964 models that were spot welded to the body hinge brace under the glove box. The major difference was that the 65-67 were riveted instead in the same location. 1968-82 Inner side of drivers side windshield post (A-pillar). Visible through window from outside. Inner side of drivers side windshield post (A-pillar). Visible through window from outside. Drivers side top of the instrument panel for late model Corvette's or windshield post (A-pillar) for earlier models. Other locations for theft identification: Engine Block Deck, Transmission, Left Rear Inner Frame Rail, Right Forward Inner Frame Rail. 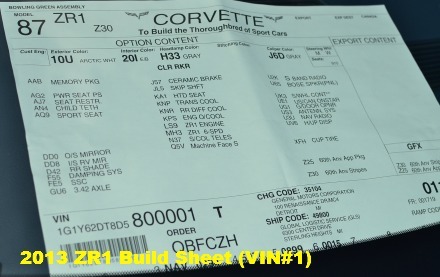 There are three Corvette VIN decoder sequences for 2009 Corvette ZR1. The First Numbering Sequence is: 95700001 these are the "pilot cars". They were built in early June 2008 and most have since been sold to Corvette dealers. Chevrolet still has this sequence #1. Second sequence is: 95800001. These are the production ZR1's. Jay Leno received #1. These cars began production in late August 2008. The third sequence is: 95900001 and this is the car that sold at Barrett Jackson and was delivered in July 2008. It is the first "Retail" ZR1. Experimental Vehicles Digits 16 & 17 end with "EX"
C8 Mid Engine Corvette 2020? 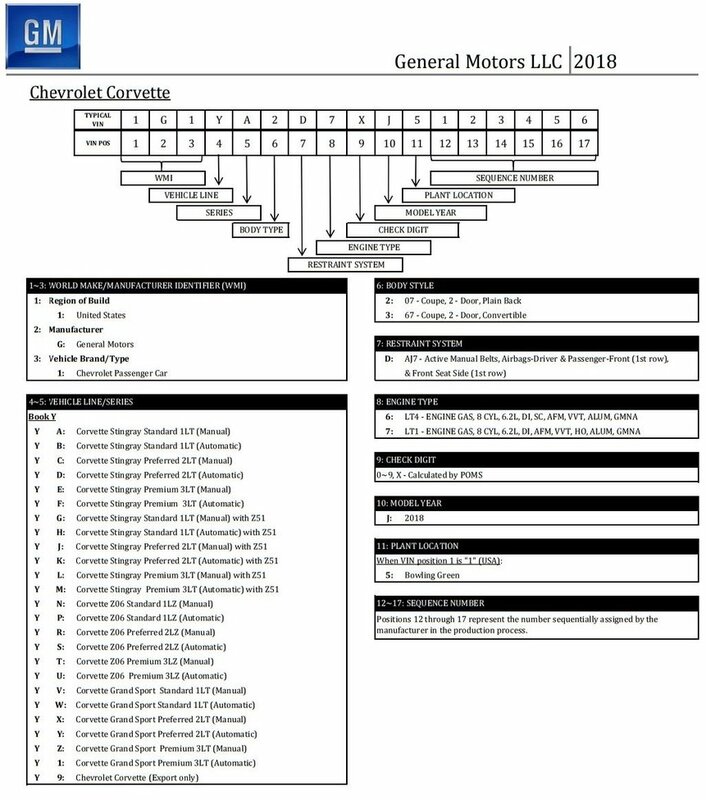 We have come to the Conclusion that its impossible to post all the differences for a Corvette VIN Decoder and Decoding engine casting numbers. So if you need more help check our Answer section.